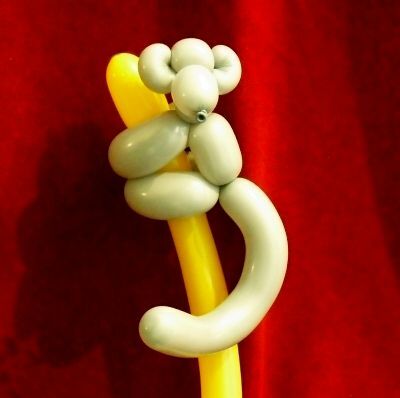 Learn how to make a cute monkey balloon animal. Aside from the head, the design is similar to that of a dog balloon animal. This balloon is a crowd pleaser and looks best when mounted to another balloon, as shown in the picture. Compared to a dog, this balloon is particularly well suited for making at events. The addition of the second balloon creates a vertical balloon sculpture that is easy to hold and carry. We also appreciate the visibility of this balloon at events as people and kids carry it around. This balloon animal is not difficult to make. In fact, it’s fairly straightforward. But note that I’m assuming that you already can execute the basic balloon fundamentals listed below. As a result, my instructions are rather streamlined. Inflate the balloon leaving about six inches of uninflated balloon at its end. Starting at the knotted end of the balloon, make a basic twist about an inch to an inch and a half in length. This forms the “nose” of the monkey. Immediately following the basic twist that you formed in the prior step, make a small pinch twist about an inch in length. You’re making the first “ear” of the monkey. Align the first basic balloon twist (marked “A” in the picture) against the rest of the remaining balloon (marked “B” in the picture), and then twirl (twist) the two pinch twists together. You’ll be holding and twisting the two pinch twists and the basic twist between them as a single unit. This is what the monkey’s “head” should look like. From here, you’re basically making the body of a dog balloon animal. Twist two basic balloon twists, each about two inches to form the monkey’s “arms.” Create a lock twist to hold the front legs together. Twist three more basic balloon twists, each about two inches. The first twist will form the monkey’s body. The second and third twists will form the monkey’s back legs. The remaining balloon segment will form the tail. Create a lock twist to hold the body and back legs together. You’re done with the twisting. The finished balloon animal monkey. Inflate a second balloon to use as a pole. Slide the monkey onto the pole through its legs and arms.